The double portrait depicts Eleonora of Toledo with her son Giovanni de' Medici. Eleonora, who was approximately 22 years old when this portrait was painted, was the daughter of the Viceroy of Naples, Don Pedro di Toledo. 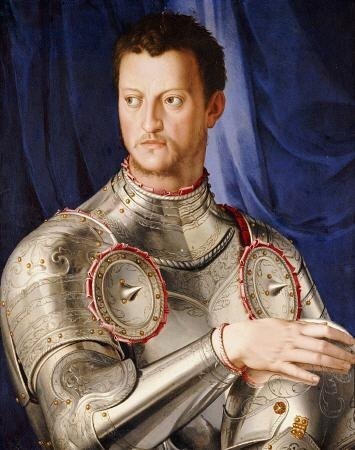 In 1939 she married Cosimo I de' Medici, duke of Florence who later became the first Grand Duke of Tuscany in 1569. 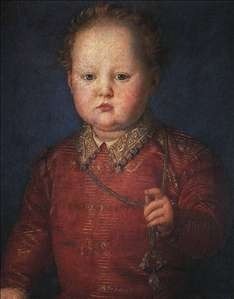 The boy to Eleonora's right is her son Giovanni de' Medici aged about two. Mother and son both died in 1562 from malaria. Bronzino became a court painter to the Medici family, who ruled Florence in the 16th century when he was working in Italy, in 1539 and continued in that role until his death in 1572. 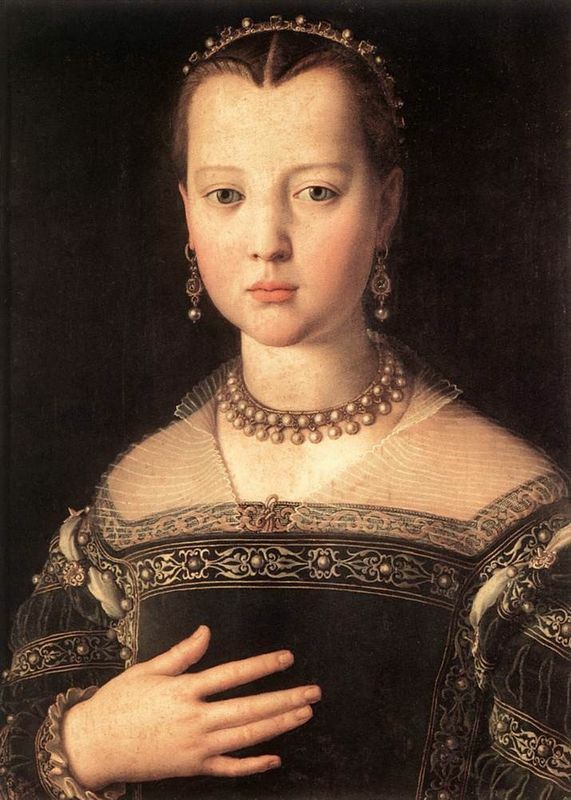 This painting, like scores of portraits and other works that Bronzino painted, was a painting of and for the Medici. The basic format of this work, Eleonora sitting on a balcony with a watery landscape to her left, is reminiscent of the Mona Lisa. Yet, her pale, oval face, harsh stare and rigid bodice counterbalance this. Her dress symbolizes the revival of the Florentine silk industry and like Ingres and Matisse, Bronzino depicts patterned textiles with elegance. It is said that Eleonora loved this particular dress and wore it often. It was also rumored that she was buried in it when she died in 1562 from malaria, but that claim has been refuted. Eleonora rests her hand on the shoulder of her son and the motif on her dress refers to her role as a mother. 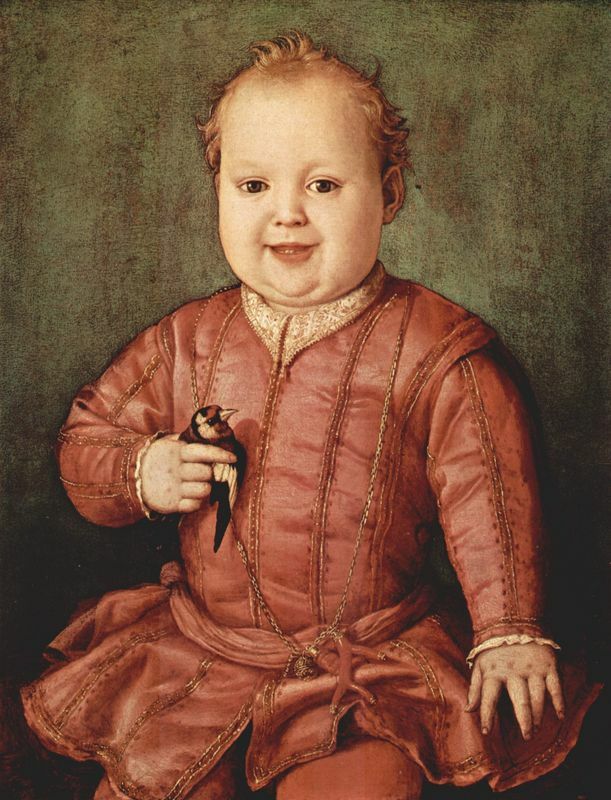 The child in this painting has been identified as Francesco, Garzia and Giovanni but as the painting is dated c. 1545 it is now thought it must be Giovanni, given his age at this time. 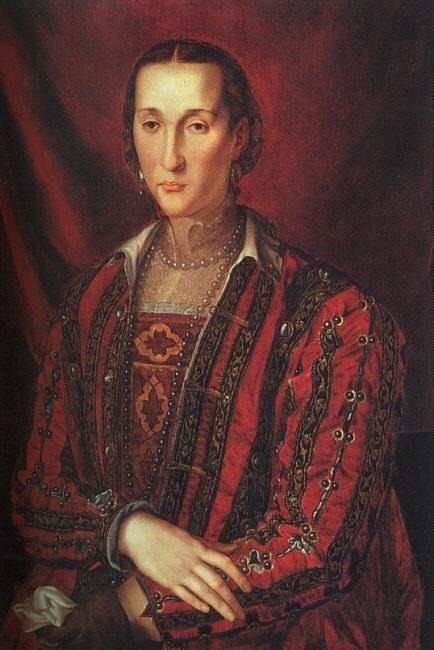 Bronzino found his greatest success in portraiture, more accurately, portraiture of noble, high-class sitters. This painting is one of his most famous and exemplary of his portraiture style. One of the hallmarks of Bronzino's portraits is to depict his sitters with placid, uninvolved facial expressions that reflect the smug arrogance common amongst the noble class in Florence at this time. 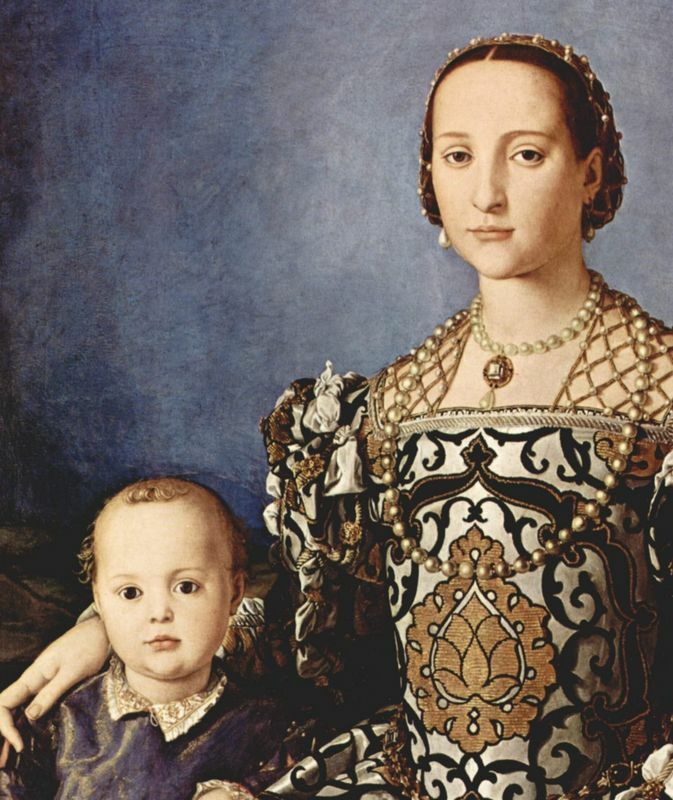 The faces of mother and son in this portrait, although slightly more expressive than some of Bronzino's portraits, are void of any real emotion. They are painted with meticulous detail and are extremely life-like, but they are like masks, revealing nothing about the individual's thoughts or feelings. Bronzino also takes great care to paint the faces using light and shadow, giving them a three-dimensional appearance on the canvas. Bronzino painted Eleonora and Giovanni several times in other portraits. 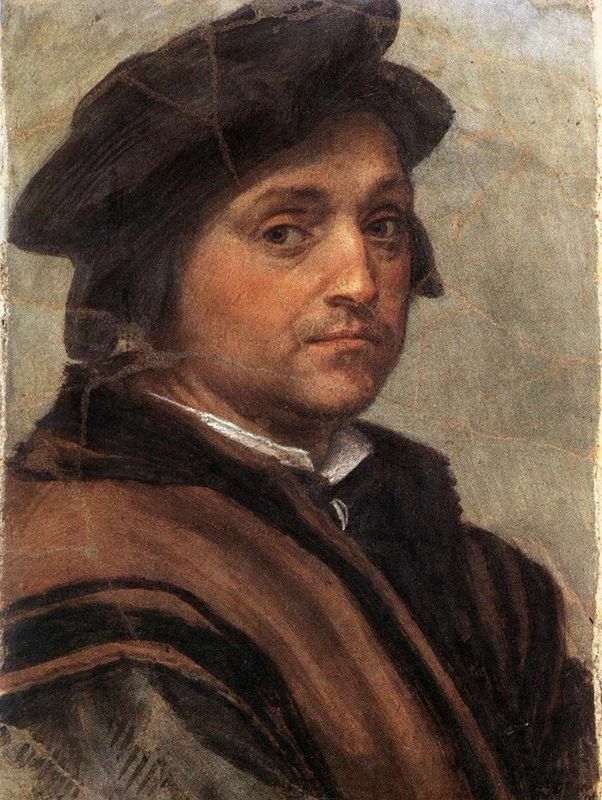 The portrait of Giovanni (see Related Works below) is interesting because it's one of Bronzino's only portraits that give his sitter an expressive, spontaneous facial appearance. Bronzino's court portraits are known for the elaborate and detailed costumes of his sitters that he captures in all their decadent glory. 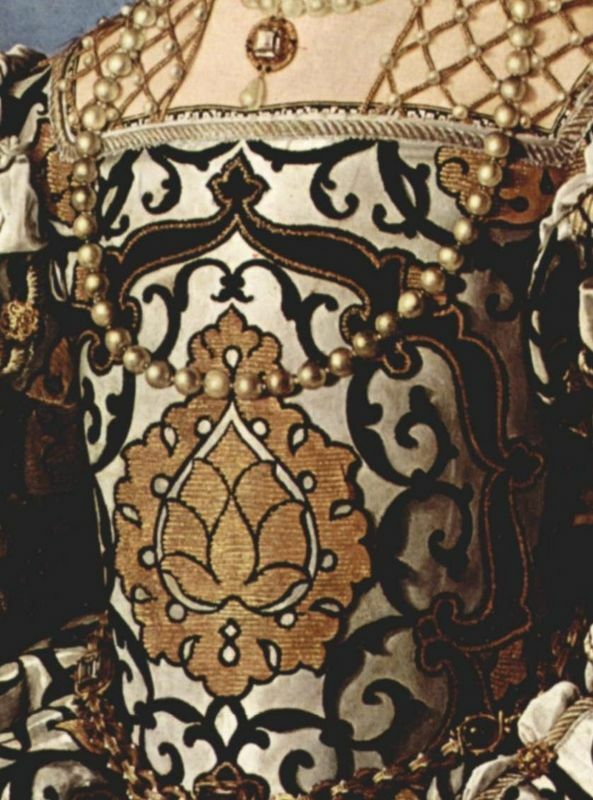 The dress worn by Eleonora in this portrait is no different and in fact, it's one of the more flamboyant outfits of all clothing worn by his wealthy sitters in his portraits. The dress, which its creams, golds, and greens and spindley details weaving throughout the pattern, takes on a character of its own and almost overshadows Eleonora and her son in this work. The dark blue, static background makes the dress stand out even more. It juxtaposes the blank looks on their faces with his exuberance that is begging for attention. Bronzino was commissioned to paint this work, believed to be the first state portrait depicting a ruler's wife and heir. This piece was intended to show members of the Medici family as trustworthy, wealthy and stable. The artist's portraits of the Medici family are expressions of their divine right to be rulers and Bronzino believed in the power bestowed upon them. 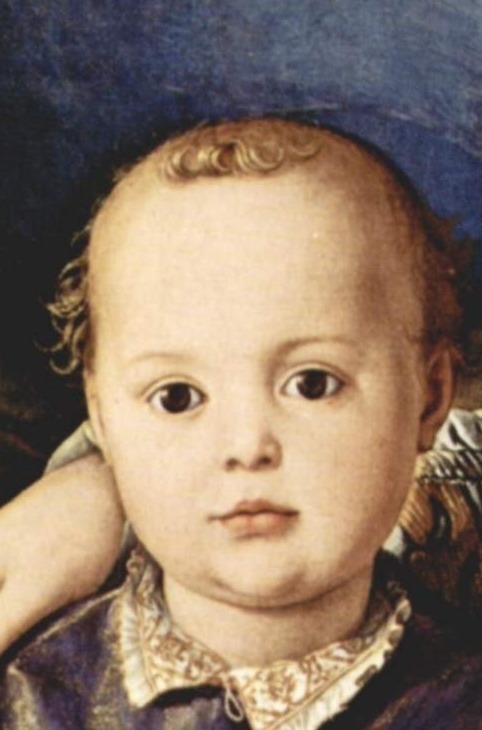 In 1551 while painting the ducal children in Pisa he wrote: "I am continually with these most saintly sovereigns, and I rejoice in the blessed sweetness of so good and benign a prince. " Destined for the church, Giovanni de' Medici was painted in this double portrait with a forehead, haloed by golden ringlets, destined for great things. Bronzino gained notoriety for his portraiture style that meshed a detached realism depicting cold and often arrogant expressions of his noblemen sitters with bold colors such as ice blue and raspberry red. His painting technique is extremely controlled and meticulous. His brushstrokes appear non-existent, which gives his work an extremely realistic, almost life-like appearance. Bronzino took special care when painting the elaborate garments worn by the Medici family in his portraits and often, the grand clothing and patterns would appear almost as characters unto themselves, dominating the portrait. 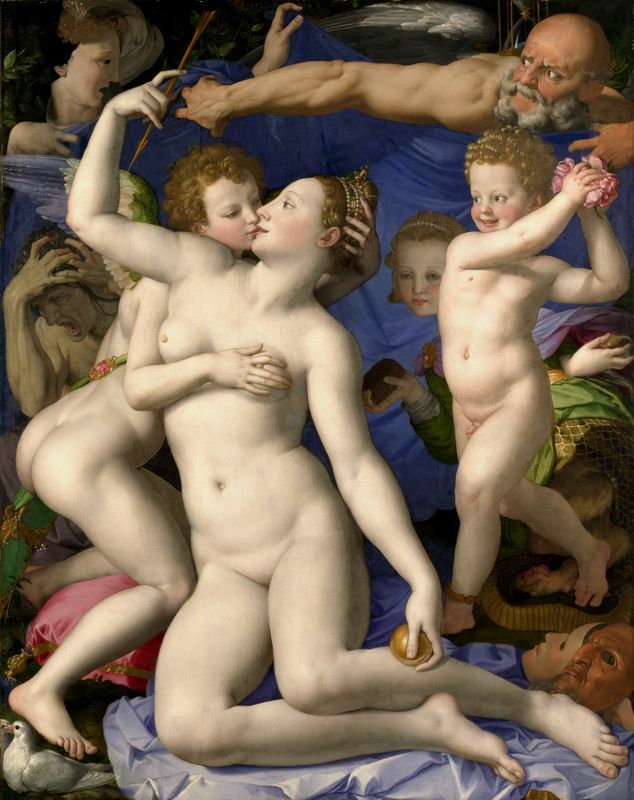 Bronzino's attention to detail was of the highest standard. The artist had broad influence over court portraiture for an entire century following his death in 1572. The aloof, detached style he used to capture the noble class of Florence, in its decadent and arrogant pride spread throughout Europe reaching courts as far as Elizabethan England. Bronzino's portraits are his primary genius and legacy to the art world and several artists were particularly inspired by his unique style. Mannerism combines various styles and is heavily influenced by the restrained naturalism related to painters such Raphael, Michelangelo and Leonardo da Vinci. Mannerism is also known for its artificial rather than naturalistic qualities. The mannerist portraiture of Angelo Bronzino was born in Florence - a city believed by many Florentine exiles to be built on corruption after the fall of the last republic in 1530 and the development of dynastic rule by the Medici. Yet, this did not stop the young Bronzino and his works soon caught the eye of the ruling class. In his later career, Bronzino became court painter to the Medici family. Bronzino's portraits are distinguished by a still sophistication and superb attention to detail. Bronzino focused heavily on the clothing and materials featured in his works and this was often said to create a gulf between the subject and viewer.